Great article on Songbird’s pedigree! Nearly two years ago a yearling filly by Medaglia d’Oro carrying #28 on her hip was getting a great deal of action at the Hill ‘n’ Dale Sales Agency consignment on the sale grounds at Fasig-Tipton Saratoga. We thought she was an exceptional beauty, and her overall balance prompted us to analyze her biomechanically. Thanks for this article. Songbird is really exceptional indeed! Continued good luck to her, and may she stay safe and sound. Neil Latham’s experience with Zenyatta struck a cord with us. We met and visited with Zenyatta early and often during her racing career. Through her eyes, we were able to communicate and connect with her like no other horse before or since. She is an ethereal being. When we asked our good friend, Don, to join us for visits, he told us that Zenyatta had affected him like no other animal had. To understand how meaningful that was, one has to know a little about Don’s career as an anthropologist, primatologist whose career spanned Professor as U C Davis and UCLA before being asked to head the exotic animal breeding program at the San Diego Zoo and Safari Park. He was responsible for breeding the giant panda, cheetah, macaque and other exotic breeds. Don had the opportunity to visit Zenyatta again in January. You can readily see his connection with Zenyatta through the photos posted on this website in February. It was a pleasure to read this comment. Dear Donna, your reaction to the work, makes me stop and pause… I am touched by your comments, thank you for the kind words. Best Wishes, Neil. Thanks for Hovis! One good outcome from the heat is Hovis hasn’t had to work quite as hard. Good luck with the French lady! Happy weekend everybody. Safe trips for all horses and jockeys. A very HAPPY BIRTHDAY to Prince George! 3 years of cuteness and many more wonderful birthdays to come. Have a lovely, smashing good time today! Thanks for keeping us “in the know”, Sheena. Happy Birthday to the little Prince George. Think he can be a bundle of mischief! We are told that if we obey we will eat the good of the land. Can you imagine what that means? Everything for our benefit comes from the land: food, precious minerals,and every kind of plant that serves as medicine. Why would we want anything artificial when we can have the real thing! The Cherokee believes that just sitting on the earth or standing barefoot on it gives balance. The earth is not dead nor does it lack any good thing. Obey and eat. Obey and be well. Obey and be happy. Obey and breathe easily and joyfully. Accept the gifts the earth offers. Obey and live! Our God gives us…the corn and all things to sustain life. Dear Kathy.A lovely day here It has certainly cooled down.Poor Hovis surrounded by all those females and a 2ft granny!Some good news from Delyth and Dylan’s nest their 3 chicks have been ringed and DNA swabs taken.Glesni and Teg were on the nest.I have no idea whether she was calling for Ceri or more food .There have some negative comments on their FB more especially from Americans I thought world war III was going to break out!I never got involved believing every’s opinion should be respected.Ceri’s body remains on the nest.I really cried reading Emyr’s blog last night.I have only got to known these birds since 20II but they have become a huge part of my spring/summer. I have sent you Prince George’s birthday photos.My,he has grown.Larry had to visit the vet when he was spotted limping outside no 10 he saidyou should have seen the state of the other guy.Palmerston no doubt!The entante was not so cordiale yesterday mother Theresa should have reminded him of a few battles we won such as Waterloo,Agincourt and Crecy! SARATOGA SPRINGS, N.Y. – Mike Smith has ridden some of the best female horses of all time – four, in fact, who are in the Hall of Fame, including Zenyatta, whose induction takes place in less than three weeks. This is a great article! I love reading about these fillies in Mike Smith’s own words. He is such a mensch — a really good guy and a class act. Thanks for posting the link. Hope Mike and Songbird have a fabulous season. Finally got the chance to see Neil Latham’s gorgeous photos at the Steven Kasher Gallery in Manhattan. The prints are huge and seeing them in person is well worth the trip for anyone who can make it. Their size and quality are truly astonishing (not to mention the subjects, of course). The viewing was even more profound knowing that Latham was inspired by his late mother…. especially the photos of fillies and The One And Only Mare, Queen Zenny. I am so happy that you got to see the exhibition at the Steven Kasher Gallery. How wonderful to experience these photos “up close and personal”. I know that it must have been awe-inspiring and deeply moving. Thanks for giving us your descriptions! Long ago and far away, there were two great fillies…. New from THE VAULT. Enjoy! Once again you have given us a fascinating article! You brought these two fillies to life again. Your finding the photos of Mother Goose and Alcibiades was simply “meant to be”. Fate intended that you write about these wonderful horses. Thank you so much for introducing us to them and giving us a sense of being connected to them and their historical importance. Brava, Mother Goose and Alcibiades — I am so pleased to meet both of you and am grateful that you were here. 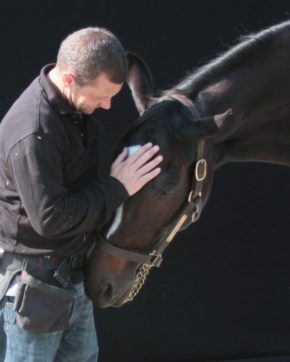 Thank you for your touching article on Zenyatta after you photographed her. There is indeed something mystical about her presence that is hard to explain. I had an unforgettable experience with her too. I was blessed to visit her on a beautiful quiet afternoon. There was only one other visitor. She had just retired. When I walked close to her – she gave me that kind look in her eyes telling me it’s alright to touch her. I will never forget that visit for the rest of my life. She made me feel welcome and very happy. Thanks Mr. Latham for your kind words about Zenyatta. Thank you for your thoughtful and very kind words. I have had the most incredible privilege of photographing the most iconic thoroughbreds living. I can say without pause, Zenyatta is of a different world, an incredible being… truly a gift. My deepest thanks go to the Moss family for their support of the work, it would not be what it is without their kindness. 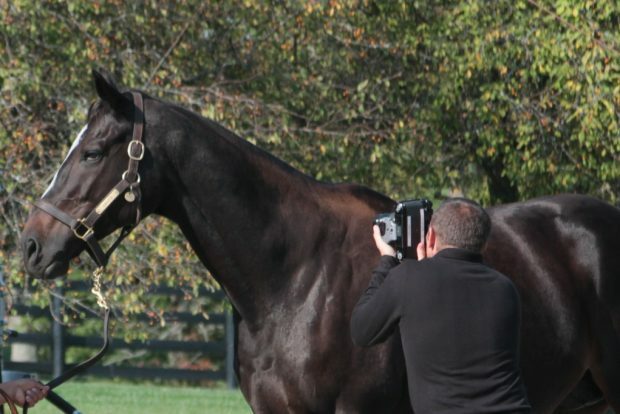 Your photographs of Zenyatta are truly amazing. Reading this article about your experience with her and her connections is wonderful. I had the privilege of meeting Ann and Jerry Moss, John Shireffs and Dottie, Kyle Acebo and Tyler Matson yesterday at Zenyatta’s induction ceremony into The Racing Hall of Fame. They are truly all wonderful, kind people who care so much about Zenyatta and her fans. I can only imagine how amazing it must have been for you to meet Zenyatta. Thank you so much for your work. I so enjoyed reading about your encounter with Zenyatta. I have found, over the years, that there are some animals who truly touch you in a way that is difficult to convey or understand. I have had that connection with several dogs that I owned, and it is truly magical. I believe Zennyatta wanted to convey to you her intuitive understanding and affection for people. I’m so glad she let you feel that. Your work is beautiful. Thank you!